Ever since i bought these mini cake mold , my hands were etching to use in baking .I thought this cake will be perfect for that. 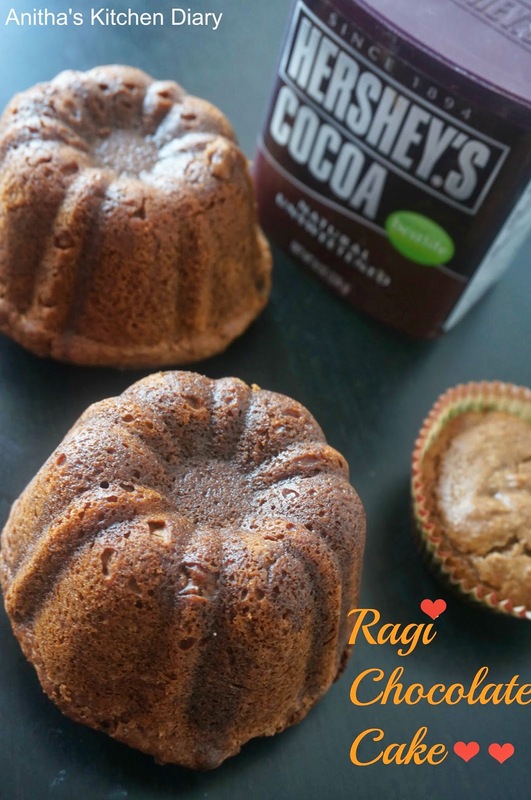 Ragi in baking is interesting and really healthy. Its a good snack for kids. Preheat the oven 370F and grease or line the cake mold with parchment paper. In a bowl sift ragi flour , wheat flour,coco powder ,Baking soda , baking powder and cinnamon. Ina separate bowl mix sugar ,yogurt,milk and oil until sugar dissolves. Add wet ingredients into dry ingredients little by little. Pour the batter into greased cake mold and bake it for 40 - 45 minutes or until tooth pick comes out clean. Remove from oven and cool it on wire rack.Serve it with chocolate syrup.